The Manager by Design blog seeks to provide great people management tips and awesome team management tips. The focus of the blog is on management, but the question is – what is the difference between leadership and management? There are hundreds of great books on leadership, and there are many resources that work to delineate the difference between managing and leading. 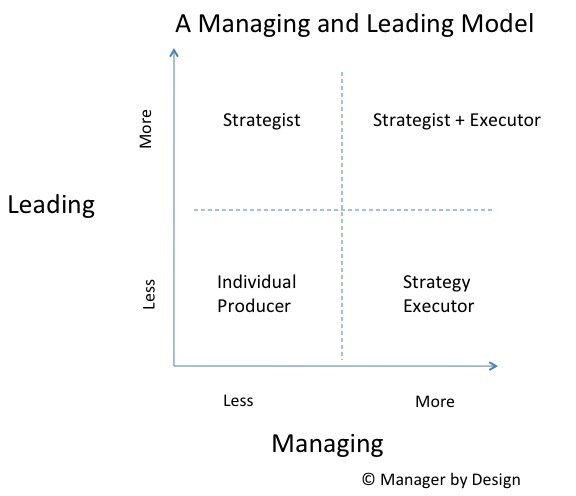 For there purposes of this blog, here is the model I have that demonstrates the difference between managing a leading. In this model, I’ve put out a grid that puts managing on the x-axis and leading on the y-axis to demonstrate their inter-relationships and where they separate. In the lower left quadrant (“Individual Producer”), you have a role that requires neither managing nor leading. I call it the individual producer. If that individual producer produces something (analyses, a product, a sale), then that person has done her job, and is doing well at the job. This person is neither managing nor leading, but still producing, and contributing. Every organization needs lots of this!